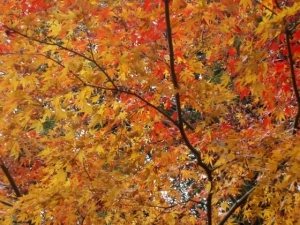 Fall is certainly in the air offering chilly nights and a hint of color change among the trees. 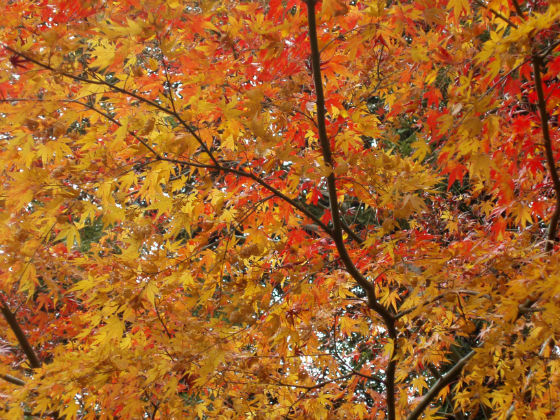 By the end of the month, we’ll be treated to October’s spectacular foliage, its annual visual extravaganza. Sweaters, jackets, and wool socks are coming out from storage, and we’re ready for hearty soups and stews, the stick-to-your-ribs meals that comfort and warm us. I’m always eager for mushrooms at this time of year. Perhaps, it is their complex flavor or their earthy aroma that makes me think of the deep woods and falling leaves. Recently, the Pleasant River Garden Club, of which I am an enthusiastic member, spent a cool, misty morning with Bob and Helene Hammond at their Lynch Hill Farm in Harrington learning about the cultivation of shiitake mushrooms. Bob has been growing these exotic fungi for several years and he generously explained his techniques to us, unraveling the mystery of these delicious morsels. Using red oak logs, he carefully drills a series of holes, fills each with a plug which bears the shiitake spores, seals the plugs with wax, and then sets the inoculated logs aside at the edge of the forest to begin the process of aging. At year or more later, the wood is soaked in vats of water and magically, within a week’s time, beautiful mushrooms emerge and grow rapidly on the log. Harvested by twisting or cutting at the base of the stems, they can be added fresh to a myriad of recipes or dried for later use. The Hammond’s have a commercial dehydrator, but they are also pleased with the results of their experiments with solar drying. The shiitake has long been a staple of Asian cooking. 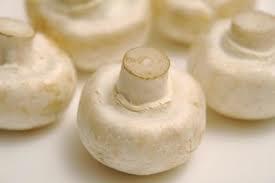 In fact, in Japan, a stunning 160,000 tons of these mushrooms are cultivated annually. By comparison, the United States grows only a fraction of this amount. Familiarity with this variety, however, is growing and, as American tastes become more adventurous, the demand for gourmet items like shiitakes expands, as well. Chewier in texture and more aromatic than the common button mushroom, the shiitake slides easily into Chinese, Thai, or Japanese dishes. But, it also substitutes deliciously for any mushroom in a wide range of cuisines. Try grilling them and topping a burger or steak. Saute and fold them into an omelette. Fry them in butter and serve on toast. You get the idea… Just remember to remove the stems which tend to be tough. Don’t discard them, as simmering the stems results in an incredibly flavorful broth that can be added to your stews and sauces or used as a braising liquid for chicken or beef. It’s great to know that a local source for all this culinary potential is just down the road on Route 1-A in Harrington. Step into the attractive store at Lynch Hill Farm and try some of their products: fresh or dried shiitake mushrooms, hand-picked cranberries, garden vegetables, plus unique gifts and crafted items. Whether your favorite mushroom is shiitake or another type such as the button, the portabella, or the smaller, baby bella, I have wonderful recipe for you from my brother-in-law. He was a fabulous cook. Half the fun of visiting his family on Cape Cod was the meal preparation and the incomparable dining. One of our favorites was his mushroom soup which he often had warming on the stove on the evening of our arrival. I tried to come up with a more clever title, but it was always “Tom’s Mushroom Soup” and I could not bear to change it. I share it with you in his memory. This soup tastes so rich you’ll swear that it is made with cream. But, your waistline will be happy to hear that the creaminess is achieved by whirling the ingredients in either a kitchen blender or a food processor. There is a “bit” of butter, so you’re not totally off the cholesterol hook, but you can substitute olive oil or a combination of both. And, as I always stress, you’re not eating all that butter by yourself or all at once, anyhow! Make a pot of it on a blustery day when all the world is gold and orange and enjoy the gifts of autumn. Saute mushrooms and onions in butter 8-10 minutes until soft. Add flour gradually to combine smoothly. Add beef broth and and simmer for 25 minutes. Correct seasoning with salt and pepper to taste. Cool. Then, puree in blender or food processor until creamy. Serve hot with a sprig of parsley or float a raw mushroom slice for decoration. For another elegant presentation, drizzle a pretty curl of heavy cream or a dab of sour cream on top.